It has been an exciting year for community engagement at YST. In addition to a commitment for musical excellence, students are exploring what it means to be an 'artistic citizen' in Singapore, by creating opportunities for themselves to acquire a broad range of skills, including conducting, teaching and mentorship. We have also seen an increase of student-led initiatives which explore the value of connecting with people through music, while reaching new audiences in the local community. From January-April, we started the year with a 10-week music program for children called ‘Project Infinitude’, a pilot program initiated by the Mahler Foundation. In April, YST presented a showcase performance event at Alexandra Hospital Auditorium called ‘Sharing the Gift of Music’ which brought together 30 YST students and the Conservatory’s major community partners including School of the Arts Singapore (SOTA), Superhero Me, National University Health System (NUHS) and Sengkang Health. YST continues to support Sengkang Health's ‘Art in Healing’ initiative with monthly lunchtime concerts at Alexandra Hospital's Auditorium, and ward performances to bring music directly to the patients. The 'Art in Healing' initiative aims to use the arts to increase a sense of wellbeing in the community. Throughout the year - particularly in recent months – YST students have been initiating their own community engagement activities for a range of new audiences. 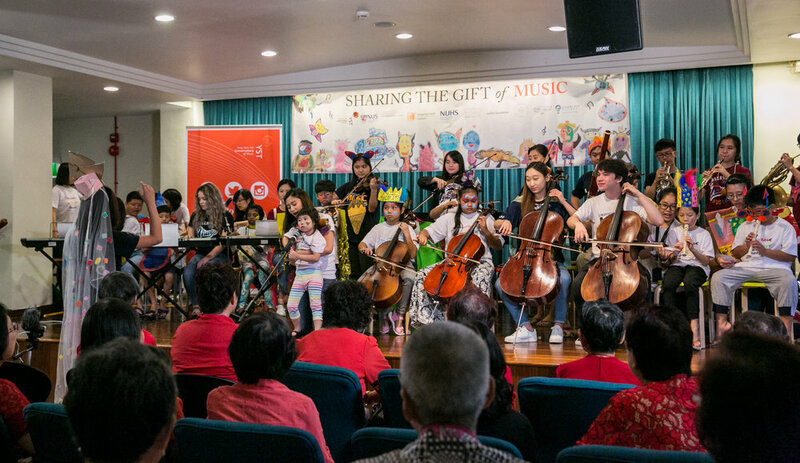 Locally, activities have included a Children’s Day celebration with our community partner ‘Superhero Me’, bringing music activities to vulnerable youth recovering from cancer and engaging with elderly patients at Alexandra Hospital. We also acknowledge students who have been ongoing leaders in their community, such as Sulwyn Lok (BMus Year 3, Recording Arts & Sciences) who is the director of the Victoria Chinese Orchestra or Emilea Teo (BMus Year 2, Recording Arts & Sciences) who became a mentor for children with learning difficulties. In ASEAN, five YST students visited Laos in collaboration with Mahidol University’s College of Music to share different musical traditions. And our alumni have also been busy with engaging new audiences such as Lee Wai Teng’s (BMus '16, Clarinet) music workshops in Pakistan. We have continued to explore interdisciplinary performances, including an ongoing collaboration with Ethos Books. Following on from a performance at the ArtScience Museum earlier this year, YST students have worked with theatre practitioners from Epiphany: NTU's English and Drama Society, to create a live-performance interpretation of a local short-story, performed at the Arts House for the Singapore Writer’s Festival. The first seniors' choir cohort has recently 'graduated' from their two-year clinical trial, part of the 10-year longitudinal Jurong Ageing Study, which aims to reduce depression and dementia in elderly residents of Jurong. The choir has had rehearsals at YST every week, facilitated by NUS Society Choir. We look forward to welcoming the new cohort at YST in 2018. In the coming months, we will host the annual YST Creative Workshop, a four-day collaborative composition program in partnership with the Singapore National Youth Orchestra. We will also be introducing the inaugural ‘Creative Music Camp’ with Kids’ Philharmonic, where children will be spending a day at YST to explore creative music making, facilitated by second year students as part of the ‘Leading & Guiding Through Music’ class. For 2018, we hope to build on our current efforts, start new partnerships and engage with even more people in Singapore and beyond.